Summer is the time when the skin faces the maximum number of issues. Your face can shock you anytime by showing up a pimple or an acne rash however the most worst feeling is when the skin starts feeling oily all the time. It simply makes you very uneasy and spoils your mood completely. So how can we deal with our skin under such circumstances? The situation rises due to extra oil secretion that happens in the skin. Oily skin attracts dirt as well as impurities quite easily and thus resulting in breakouts. The T-zone is the area that suffers the most. 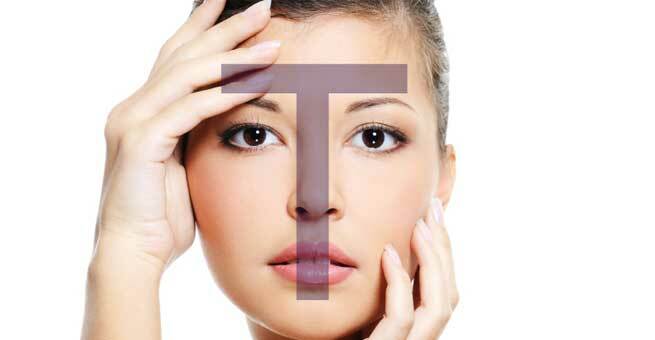 T zone is basically the area consisting the forehead, nose as well as chin. What are the ways by which you can avoid the oil secretion in the T-zone naturally? Maintain the face clean and fresh always: Wash the face twice a day, both in the morning as well as night. Cleanse your face using a mild cleanser instead of soap as you do not want to entertain unwanted chemicals into the skin. Besides we do not want the natural oil secreted by the skin to get wiped off completely. Maintain the pores clean: People with dry skin except for the T-zone which is oily, should use cleansers meant for oily skin during summer and then switch over to dry skin cleansers in winter. A simple pore cleansing recipe is, take some sandal wood paste and equal quantity of gram flour and mix them into a fine paste using water. Apply this on the T-zone or the whole face and cleanse away the dirt from the pores. Use a toner: Rose water is the best natural toner. You can also make toners at the comfort of your home. All you got to do is take a tomato or a cucumber, take its juice and apply it on the face and leave it for some time and then wash it off. Tomatoes and cucumbers are very good natural toners. Hydrate yourself: In summer, your body needs ample of water to replenish the system. When you consume water, it helps in detoxifying the body naturally by eliminating the toxins from the body. As per studies, a person needs to have 8-10 glasses of water per day. Hydrating your body can be in the form of fruit juices too. Exfoliate: Exfoliating your face especially the T-zone is a very important step to control the oil and eliminate the dirt and oil secreted in the skin. Homemade scrubs work best for this purpose. Take some soaked almonds, crush it down and add milk to it and use it as a scrub on your face especially on the T-zone. Healthy diet: Include a healthy diet during summer. Avoid all kind of fatty and junk food like pizza, bacon, deep fried items etc. as consuming those triggers the excess sebum secretion in the skin. Choose an oil-free Makeup: Makeup should always be oil free one during the summer. Using a toner and a primer is a good way to make the makeup stay for a longer time without causing oily T zone. Aloe Vera: Aloe Vera along with cucumber juice is a very good remedy to control oil on the T-zone. Tomato and honey: Apply juice of tomato along with honey to control the oil on the T-zone. Natural Astringent: Make your own natural astringent by taking ingredients like cucumber juice, vinegar, rose water and tomato juice. Mix it with each one and use the best that works best for you. Papaya: Papaya is a very good for oily skin. Mash pieces of ripe papaya into a bowl and add few drops of lemon into it and mix well. Apply this face pack on your face and neck concentrating on the T-zone primarily. Wash it off after 20 minutes. This face pack is excellent for removing the excess oil and rendering a glow to your skin.